Good stuff. Video photography is the future! You really get the feel of what it is to be in the crystal swarm. And catching of subparhelic circle gives hopes for other plate-born not-yet-seen halos. In one of the recent postings folks applied heroic terms to my halo actions. But others do this diamond dust hunting as well - namely Luomanen, Mikkilä and Ruoskanen. And of course Tape in Fairbanks. For this project in Rovaniemi it took courage for guys to leave southern Finland and go north with no quarantee of diamond dust. Sacrifice of sleep is always present. I heard that even when these guys eventually slept, they woke up every 1/2 hour to check the situation. Yes, we took turns in waking up and going outside. Since we only had limited time at our disposal, we were determined to make the most of it. Next time we should really plan the video shoots and execute them with much more care and preparation. Luckily in the future we'll be able to capture good quality HD video. It's a pity that Marko R. and Jukka could not join us due to conflicts in their schedule. What is the video capturing apparatus that you used? The sensitivity seems remarkable. Or is it due to Mikkilä's HID? I would love to capture some video this winter also, but my experiments last winter showed that I do not have a good enough device in my posession. The sparkles on the "film" were not exactly a truthful record of the true scene. In the future the HD video & high ISO capabilities of the latest DSLRs will no doubt revolutionize our possibilities. In the meantime I'm keeping the little IXUS with me. With any luck I'll see the "cable halo" again and will be able to capture video this time. Fantastic images and breathtaking crystal swarm videos. You two had a really rewarding time in Rovaniemi. You did not only get your personal firsts, but also images that had rarely been photographed before. Am I right that these are the second ever divergent light 120° parhelia? The first one was captured only last year by Marko R.
Yes, the video of your compact has good sensitivity. What's in that other video? Ágnes, yes this is probably the second observation of the divergent 120 degree parhelia. It was easily visible to naked eye but did not last all too long. I tried to shoot it with an all-sky composition, but botched the focus as I fiddled with the camera. It's pretty difficult to check the viewfinder when the camera is in that position plus there's the risk that you'll breath fog onto the lens while squatting below it, trying not to jerk the tripod while wearing so much clothes that one actually resembles the Michelin man... plus I was standing in the middle of the road. Haha, ok, I admit it: these are pitiful explanations, I just dropped the ball right there and then :). Marko, the other video shows the crystal swarm lit by the enormous flux of photons that Mikkilä's hellish lamp churns out. Über Hid he he. In kilpisjärvi we tested both normal halogen cyclop and Hid modded cyclop and there wasnt huge difference in brightness, maybe Hid was a little bit brighter. But Hid light is actually whiter than normal halogen light is. That might be the reason why it seems to be brighter. I forget those videos completely, nice indeed. Yep, the fact that the HID lamp has higher color temperature surely contributes to the impression that its brightness is superior. Another advantage is that when you shoot HID halos the correct white balance is at a higher color temperature. In other words the light includes more energy (=information for us) at shorter wavelengths. Consequently, the correct white balance includes more information on the blue and green color channels (assuming the most common RGB filter array in the camera) when compared to halogen light where the red channel dominates. As the correct white balance is then set, the resulting image is likely to exhibit less noise (less line/pattern noise in particular) than a halogen lamp shot where the correct white balance often is - in reality - in the neighbourhood of 3000-3500K. Furthermore, as the high wattage halogen bulbs draw relatively high currents (always in the order of several amps, even up to 10 or more) from the battery, they are also likely to suffer from under voltage making things even worse. I think Mikkiläs HID is around 4500-5000K but I have not actually measured it. Thanks Jari for the white balance info. That's new stuff for me. Yes Colorbalance is different in Hid lamp. Marko R, it also helps that it is likely to be of different color temp than the background sky. After that just choose color temperature white balance in your RAW conversion software and move the slider until the paper is as close to neutral gray that you can get (check with the color checker tool). That should give you an idea of the color temperature. Another method to find out the effective temperature of the lamp: Photograph the lamp (or better, the sheet of paper) through several filters. That allows you to construct the black-body curve. If then one is able to say at which wavelength the maximum of the curve lies the temperature can be calculated using the Wien displacement law. I'm not familiar with this method but I wonder if it requires the linear output from the sensor? That, of course, is the way the native readout from common DSLR sensors is anyway, but in RAW conversion (an in the in-camera JPG conversion for that matter) this output is adjusted in order to produce a "normal" photograph. Some RAW converters, however, allow one to come up with the linear data. Fantastic job and unusual phenomena! Congratulations! 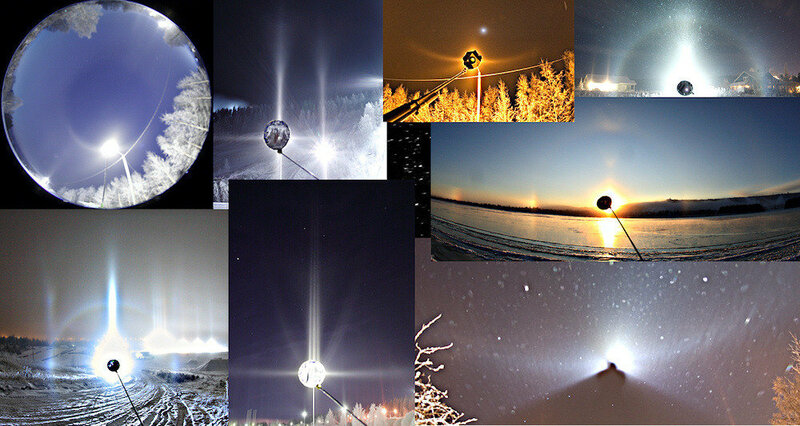 Wow superb photos I live the divergent halo forms the 120d parhelia very unusual and the superparhelia awesome. Have you tried looking for subCZA or sub-120d parhelia during your expedition? Keep up the good work and keep them photos going!! Jakub, Michael, thanks guys. We've indeed tried to get the subCZA and the sub120 parhelia among other things but so far no such luck. SubCZA is hard to come by. 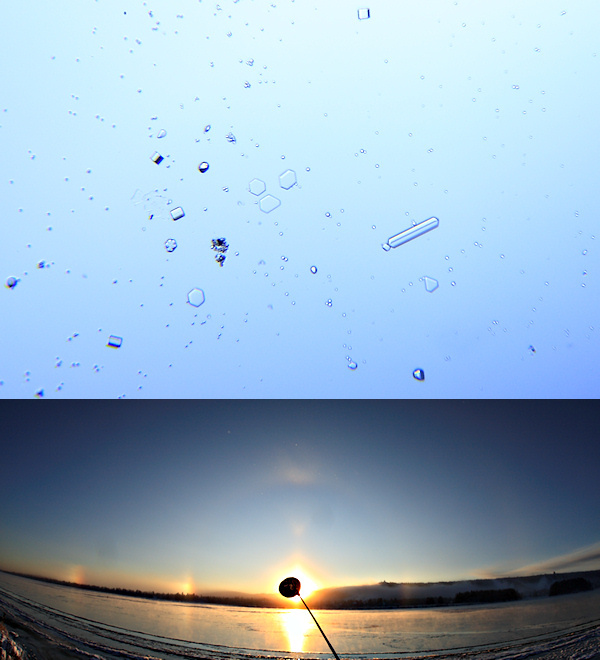 You need unusually small tilts of plate crystals. Also other factors may be involved. I have several times looked below horizon with lamp in a plate containing swarm, but no success yet. Yep, seems to be hard to get. Marko has had several attempts at this. I suppose we need just the right conditions in order to get good solid plates that orient very well.